Beneath the Big Dipper, beneath the Pleiades, beneath a twinkle carpet of stars against the black-velvet predawn, a procession of rental cars winds up a steep road, twisty with switchbacks. 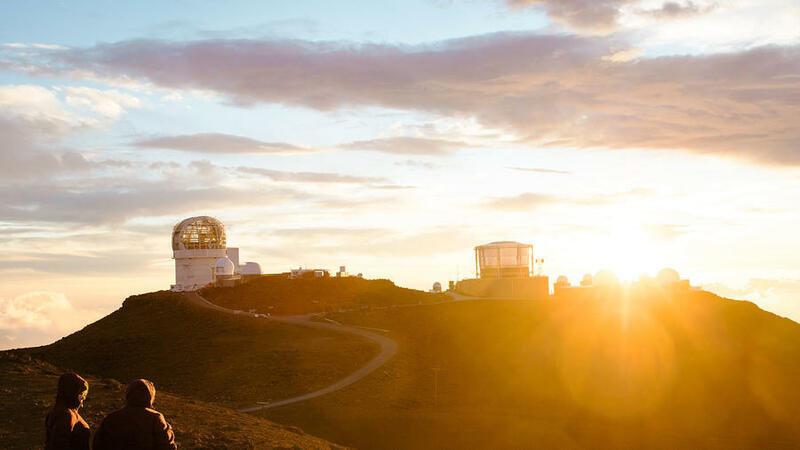 They are all headed to the same place at the same time: the summit of Haleakala—the mighty shield volcano that makes up the east side of the island of Maui—to witness the first, brilliant appearance of dawn. It’s an improbable tourist outing in so many ways, not least of which is the 3 a.m. wake-up call required to arrive before sunrise, driving two to three hours from the oceanfront resorts of Maui to the observation post at the lip of the crater. This is no casual jaunt: From sea level to peak, the altitude rises 10,000 feet, and the route’s most treacherous section must be navigated in utter darkness, without streetlights of any kind. (Oh, and watch out for wandering cows.) Near the top, where the road winds uphill at a white-knuckle pitch, guardrails are conspicuously missing. Then, there’s the clothing: Haleakala’s dress code is more skiwear than beachwear. I learned this firsthand when I pulled into the summit parking lot one morning at 5 a.m., stepped out of my car, and was buffeted by gale winds that felt shockingly polar. It’s hard to imagine when you’re basking in Maui’s tropical warmth down below, deciding which bikini to wear, but if you’re intent on sampling this national park at sunrise, you will need long underwear. You will need a down jacket. A scarf. A hat. Mittens. On the day I visited, the presunrise temperature was 36°, with a wind chill factor of –10°. Haleakala, translated from Hawaiian, means “House of the Sun,” which is both appropriate, because its peaks tower over the island, and laugh-out-loud ironic, because the volcano tends to make its own weather, which often includes brooding clouds and bone-chilling rain and everything but sunshine. Rising 28,000 feet from the seafloor, the volcano is as tall as Mt. Everest. Like all volcanoes, this one was created by a “hot spot” in the planet’s crust, building over eons, and eventually breaking the surface. Haleakala was born 1.5 million years ago, give or take a few thousand, but it is not, as people suppose, an extinct volcano. It has erupted at least 10 times in the past thousand years, most recently in the 16th century, and it is expected to wake again. Lava from these tantrums is visible throughout the park—in sharp rocks, smooth whorls, cinder cones, powdery ashes. This harsh, moody place remains one of Maui’s most popular destinations for a simple reason: It’s one of the most spectacular landscapes on Earth. I have lived on Maui, on and off, since 2007, when I came here to research a book, got myself hooked on the place, and found I could never completely leave. On a few occasions, I’d made the drive to Haleakala’s summit, gasped at its lunar beauty, and hiked briefly down Sliding Sands Trail. But otherwise, I was a browser. The volcano was there, and on an island teeming with natural wonders, knowing that was, in its own way, enough. While I am definitely game for transcendent adventures, I hadn’t felt the need for such a merciless alarm-clock setting. I’d heard less alluring accounts of sunrise too, tales of surly conditions and low visibility and idling tour buses belching out fumes. Park staff responded by touting sunset as the more desirable experience, pointing out the warmer temperatures and saner schedule of a late-day visit. Even so, Haleakala’s new logo, unveiled for the National Park Service’s centennial in 2016 features … a sunrise. When the first rays pierced the horizon at 7 a.m., casting a fierce citrine beam, everyone broke into applause. People smiled, clapped one another on the back, took selfies. Then they beelined for their cars. “The world today is sick to its thin blood for lack of elemental things,” the naturalist Henry Beston wrote, “for water welling from the earth, for air, for the dear earth itself underfoot.” It’s a familiar lament. We’re the masters of digital everything; we can push a button and have cat food or dim sum or 3/4-inch wood screws delivered within the hour, but here’s what our daily lives are missing: awe, humility, a deep and abiding reverence for the natural world. This is no small loss. When we separate ourselves from the rest of nature, we lose the very connection that sustains us. National parks are precious because they remind us of our essential wild selves. “Haleakala has a message of beauty and wonder for the soul that cannot be delivered by proxy,” the writer and adventurer Jack London declared, after horse-packing into the crater in 1907. London was struck by Haleakala’s “lonely and unseen grandeur,” an observation the ancient Hawaiians agreed with: They considered the vol-cano’s darkest reaches and its looming summit the province of gods, not men. Throughout the park, archaeologists have found the remains of heiaus—ceremonial temples—and evidence of ritual burials, with the dead entombed in caves or pits. Near the volcano’s peak, the world’s most powerful solar telescope is being built, and there it will be trained on the heavens, far from the diluting lights of cities. Yet for all the activity around its rim, Haleakala doesn’t yield its secrets easily. To know it, you must descend into its heart. Perched at 6,380 feet in the valley’s lush eastern end, Paliku cabin is humble and rustic, its shape so simple—a box with a peaked roof and a tiny chimney—that a 5-year-old might have drawn it. Paliku is Depression-era vintage, and it shows, but after the steep, slippery 10-mile trek to its front door, accompanied by constant lashings of rain, no five-star hotel suite ever looked better. Although the cabin is spartan, its surroundings are anything but: Paliku is tucked in below soaring rain-forest cliffs, streaming with waterfalls. The ground is a wild rumpus of ferns and shrubs and trees and flowers growing in the thick black mud. The air, rich with moisture, smelled like it had been freshly laundered. Volunteers sometimes accompanied McKinnon on his resupply and maintenance runs, trading elbow grease for the sought-after experience of overnighting in the crater. (Cabin reservations are hard to come by, booking up months in advance, but volunteers may stay in the rangers’ cabin at Paliku.) The chance to see a wide swath of the park was worth the unappealing job I’d been assigned: cleaning the cabins’ outhouses. Our circuit to Paliku would take us over 20 miles of trails. After a brief lesson in knot tying, we set off up the supply trail, me hiking and McKinnon riding and leading the mules. The morning was drizzly and misty, with pale rainbows visible in the distance. It wasn’t long before we met a pair of nene, the endangered Hawaiian goose, standing on a rock gazing regally out to sea. Nene are elegant birds, cream- and gray-colored, their delicate heads topped with stylish black helmets. They mate for life, foraging in the lava for herbs, grasses, seeds, and berries. Twenty-five thousand nene once lived in Hawaii; by 1950, hunters, feral cats and dogs, and invasive rats and mongooses had reduced them to a few dozen. But statewide conservation efforts have paid off: Now there is a small but viable population of 2,000 birds, with about 250 living in Haleakala. Climbing to the rim, we intersected the Halemau‘u trail, a main hiking thoroughfare, and dropped onto a precipitous 2.6-mile descent. The trail was a ribbon of rocky catwalks, barely wide enough for a mule, and the penalty for stumbling on this section was a sheer, thousand-foot drop. “You’re not scared of heights, are you?” McKinnon asked casually, as we took in the huge view of the crater, laid out below us like a great green bowl. At a glance, Haleakala can seem sparse, almost desertlike, but in fact it’s full of plants and animals as unique as the park itself, more than 400 endemic Hawaiian species. Ferns and shrubs and flowers burst from the lava; they have poetic names like na‘ena‘e (a member of the sunflower family), and ‘ohelo (related to blueberries), and nohoanu (a native geranium). And of course there is the iconic ‘ahinahina, or silversword, a spiky Seussian orb that looks more like an ocean creature than a plant. Its leaves are coated with tiny reflective hairs that give it a silvery glow. The silversword is not a plant in a hurry: It might wait 60 years before busting out with its once-in-a-lifetime stalk of hundreds of purple flowers. Then it dries up into the landscape, never to bloom again. This species, too, was pulled back from the brink, after years of souvenir takers, feral goats, and marauding cattle had trampled the ‘ahinahina nearly to extinction. Haleakala’s ecosystem is fragile, easily damaged by invasive species (including humans), and the park is battling to restore the native balance, an ongoing, labor-intensive quest: No national park contains more threatened and endangered species. Haleakala is said to be the quietest place in the world, but that night the wind howled. Gusts of rain battered the cabin’s tin roof and shook its windows. Outside, the sodden mules munched grass, water dripping from their tails. Inside, I sat at a long wooden table and paged through the visitors’ log, years of late-night Paliku musings. The logbook was filled with accounts of rain. “Where the EFF is the BUTTER? !” one edgy camper demanded. “What happens at Paliku stays at Paliku,” warned another. But mostly there were odes to the volcano’s mystical aura. Someone drew sketches of her dreams in exuberant pink ink. “There is something otherworldly, magical about this place,” one woman wrote, adding: “I feel blessed.” And in the candlelight, warm from the wood stove and dry in the deluge, surrounded by wild, singular, primordial Maui—I closed the book and realized how much I agreed with her.